Pity the nation that has to silence its writers for speaking their minds. Pity the nation that needs to jail those who ask for justice, while communal killers, mass murderers, corporate scamsters, looters, rapists, and those who prey on the poorest of the poor, roam free. Her full statement is here. The Reuters’ take on Roy’s Kashmir commentary is here. 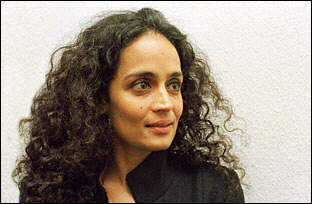 Roy won the Booker Prize in 1997 for her novel The God of Small Things. This entry was posted in Acts of Violence, Feminism and Law, Sisters In Other Nations, Socioeconomic Class. Bookmark the permalink.